Symbol’s SleepFresh active temperature control system includes an app for easy consumer use. HIGH POINT — High-tech performance fibers, new cooling foams, smart beds and app-controlled adjustable bed bases are giving bedding retailers new ways to connect with today’s consumers. They are also giving consumers a whole host of benefits, all designed to make them more comfortable at night, thereby giving them a better night of sleep. One key to selling bedding’s new family of technologies, producers say, is to make the comfort connection with consumers, explaining to them how those new features will give them more comfort at night. 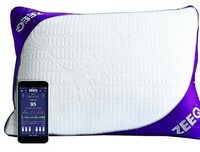 Intellibed’s Midnight is a high-end model that features the company’s proprietary Gel Matrix technology. Warrick Bell, vice president of product development. “Our SleepTailor pillow match system helps customers find the right pillow for their body,” he said. “By combining their preferences and measurements into a bio-mechanical model, the display takes the guess work out of finding the perfect pillow. It also helps remove indecision and improves the confidence shoppers have in their choices. Protect-A-Bed’s SleepTailor pillowfitting system brings technology to the sales floor and helps consumers find their perfect pillow. Malouf’s new CarbonCool technology, as the name suggests, is designed to deliver cooler sleep. PureCare is working with its retailers to create retail displays like this that spell out key new technologies and their benefits to consumers. Symbol is doing well with its SleepFresh line of active temperature control sleep sets, the company reports. Southerland’s Evolution bedding line features copper-infused foams, while the Ionic Sleep System features sleep accessories that use copper ions to help improve hygiene and overall skin wellness. “Room temperature is the No. 1 disruptor of sleep,” noted Nicole Slinger, vice president of specialty products at Symbol. “SleepFresh allows each sleeper to select from five heat settings, five cool settings or one neutral air setting, all with a touch of a button from their phone or tablet, giving our consumers total thermal control and comfort. Protect-A-Bed’s Zeeq Smart pillow combines sleep tracking, built-in wireless speakers and snore-stopping technology to improve the way consumers sleep, the company says. PureCare is focused on using technical textiles to enhance the health and wellness of the sleep environment, said Sean Bergman, chief marketing officer. He said those textiles offer several powerful consumer benefits. “PureCare sheets, pillows and mattress protectors featuring FDA-reviewed Celliant performance fibers have substantial benefits to the human body, including promoting a temporary increase in localized blood flow at the site of the application in healthy individuals, promoting better performance, better recovery and better sleep,” Bergman said. “The results are real, and consumers are much more aware of them now that they have been reviewed by the FDA. Ergomotion’s Contour Pure Slim model prevents compression of the middle of the body for consumers who have a more mature body structure, the company says. “The infrared particles embedded in the core of the fibers never stop working, and work through multiple layers of sheets and clothing, which is a key benefit because the sleeper can choose which layer of top-of-bed product contains Celliant, and mix in other technical textile-powered layers to further customize their sleep environment. Malouf’s Z Pillow with CarbonCool technology actively cools sleepers, the company says. Phil Sherman, president of Customatic Technologies, said his company aims to solve consumer problems. Advanced Sleep Technologies, which entered the U.S. market with a showing in Las Vegas earlier this year, touts the power of customization. “The ability to adjust the firmness of a mattress was previously limited to air, which accounts for only about 5% of beds sold,” said Paul Longman, CEO of Advanced Sleep Technologies. “Our Comfort Control Technology opens up that ability to spring and foam, the two most popular mattress types on the market. That means customers can easily make comfort and support adjustments to either side of the bed in their own homes, any time they want, while still getting the mattress type they already know and love. Advanced Sleep Technologies offers Comfort Control Technology for sleeper customization on its spring mattresses, like this model, as well as for foam and air beds. The company also offers a virtual reality sales experience to help consumers understand the technology in its sleep sets. Southerland has incorporated copper ions throughout most of its product lineup, a move that gives consumers several benefits, the company says. 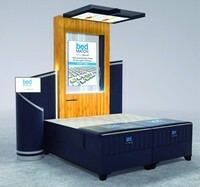 Kingsdown’s new BedMatch 3-D Fit is designed to help consumers better find the right mattress for them, removing indecision on the sales floor. “The benefits of our Alexa-enabled technology in our adjustable bases include helping people with mobility issues. The technology is hands free and eyes free,” said Dan Baker, Glideaway’s executive vice president of sales, marketing and merchandising. “Alexa-enabled devices and voice activation in general are growing in popularity. Projected growth in 2018 is expected to be more than 23%. “The Cool & Cozy Pillow cover in our Nature Collection is a dual-sided pillow cover utilizing polyethylene performance yarn that is cool to the touch on one side of the pillow,” said Blu Sleep President Alex Ciccolella. “Unlike phase change material topical fabric treatments, this high-tech performance yarn absorbs body heat and moisture then wicks both away from the body. The ‘cozy’’ side of the pillow features bamboo from rayon.